In the November Pula Imvula we discussed the influence of leadership as an important management function of a manager on a business. In this article the focus will be on certain other broad skills a manager needs to apply for his/her business to be a success. We will look at management from a broader perspective because a manager does more than to merely plan, organise, implement and control. The focus in this article is on certain skills and not on management functions. When a person starts a business, such as farming business, he/she takes on the role of Chief Executive Officer (CEO) and begins to manage the business by planning, organising, implementing and control – the management tasks. Whilst attending to the management tasks the CEO must also consider the management functions of decision-making, communicating, motivating, co-ordinating, delegating, maintaining discipline and leading. When on his/her own the owner/manager or the CEO perhaps does not pay attention to all these management functions. However, should the business grow, and employees are appointed, more attention will have to be paid to these functions. As more and more employees are appointed, the more the CEO realises the need to appoint employees as managers, thereby creating a hierarchy of managers. Broadly speaking there will be three levels of management in a business. As a business expands, the first level of managers to be appointed will be so-called first-line managers. They are the lowest level of management and are frequently called supervisors or foreman or team leaders. They are appointed to take on the day-to-day burden of implementing plans and controlling human and other resources to help the business to perform effectively. Eventually, as the business grows more the second level of managers could be appointed, so-called middle managers who will supervise one or more first-line managers. They will focus more on organising and control of resources. Middle managers have titles such as Head of a Department, Farm Manager, Factory Manager, and so on. And then eventually so-called top managers could be appointed with titles such as Managing Director or Divisional Manager. Top managers are appointed and together with the CEO become responsible for planning, identifying and selecting appropriate objectives and courses of action. Apart from all other skills required, all employees on one of these levels of management requires three additional and exceptional skills to be successful as managers, whatever the level. These skills are conceptual skills, human skills and technical skills. Conceptual skills are demonstrated in the ability to analyse and diagnose and solve a situation in such a way that it will have long term positive effects on the business. Top managers require the best conceptual skills, because their primary responsibilities are planning and organising. With the CEO, top managers must think about the future of the business – where do they want the business to go. They must think about the way forward for the business and plan accordingly. Human skills include the ability to understand, alter, lead and control the behaviour of other individuals and groups. It also includes the ability to communicate, co-ordinate, delegate, motivate people and to maintain discipline. Human skills are needed by all levels of managers. Technical skills are the job-specific knowledge and techniques required to perform an organising, implementing and controlling role in the short term, day-to-day. Examples include specific production skills, marketing and accounting skills, skills required more by first-line managers. All managers require these three skills but the time they spend using a specific skill in their working environment varies as indicated in Table 1. 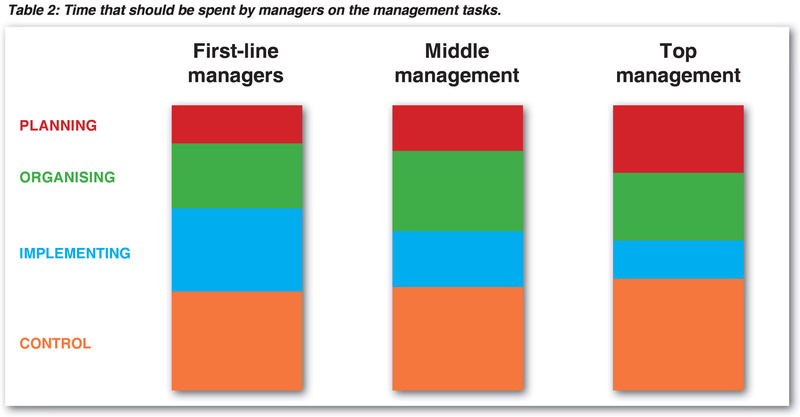 Regarding the four management tasks top management should spend most of their time on planning and controlling, middle-management on organising and controlling and first-line management on implementing and controlling (Table 2). If or whilst you are on your own you are required to apply conceptual, human and technical skills on your own to make a success of your business. It is really a tough job. As your business grows and you employ more people this will change because you will eventually employ managers to assist you. When analysing management, it becomes clear that the management tasks (plan, organise, implement and control) and the management functions can be learned and developed by training and applying it practically. This can be done to such a level that to manage becomes a profession. Why then this discussion of management? It is quite clear because of the increase of the population and the resultant increase in the demand for food as well as changing preferences, South Africa will need professional farm managers to supply the increasing demand. This applies to whether you are farming on your own, a small farmer or whether you are a mega farmer. Therefore, are you on your way to becoming a professional farm manager?